Ø It put pressures on utility services like water supply, gas and electricity. Ø It increases traffic congestion and parking problem. Ø It creates problems of light and ventilation for adjacent small structure. Ø Fire fighting problem in the building. Ø Problem related to inadequate number of lifts. Ø Problems due to inadequate parking space. Ø Lack of children’s playground. h) Selection of building materials, the consultants are required in conjunction with experienced contractors. j) Special financial policies for consultants/contractors financing should be introduced. It would be included: i) reduction of bureaucracy, ii) generous advance payments, iii) risk guaranties etc. k) Overall management effectiveness is essential for the construction sector. It should be managed on an institutional basis, and the construction actors have contractors, laborers, managers and other related actors as active participants. 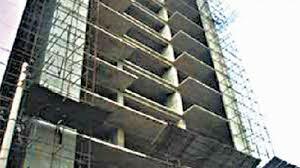 n) Special attention would be given to protect the physical environment of the project’s site. Existing “Legal action” procedures would be updated in which legal action can be taken against the faulty actors.